Guardians of the Galaxy (read my review here) was the surprise hit of the Summer 2014 movie season, coming completely out of left field to wow audiences with it’s smart humor, slick visuals, and excellent 1970s era soundtrack. A big part of the success of the film was due to its underdog charm – it didn’t have any big-name heroes, and no proven movie talent to speak of (the most established filmic actors – Zoe Saldana, Bradley Cooper, and Vin Diesel – are largely unrecognizable to varying degrees), with the expectation that a well-liked but inexperienced television actor – Chris Pratt – would be able to carry the film. And somehow this combination, with the excellent scripting and directing of James Gunn, combined to rake in a combined $773 million worldwide. These are some pretty big shoes to fill. So, how does the sequel hold up? In a word (or two), very well. Very well indeed. While the film is, necessarily, missing some of the surprise of the first one (much like John Wick 2 lost an edge to its predecessor simply for coming second), it does have just as many laughs as the first, and builds characters even further (as one would expect). This movie is definitely best seen by those that have seen the first one already. Much of the character development is dependent on some sort of foreknowledge of the characters and their (sometimes complicated) relationships. That said, this movie has enough going on to keep even a complete Marvel neophyte interested and involved – I’m just saying your best viewing experience is to watch the films sequentially. We pick up with the gang shortly after events from the first movie. The opening sequence is an absolute delight, as the main action is in the background, while the foregrounding…well, I don’t want to spoil your enjoyment of the moment. Suffice to say that if you’re not smiling by the two minute mark, you’re in the wrong theater. After dealing with their contract, Rocket – predictably – manages to get the group into trouble, and much of the rest of the movie is moved along by these initial (bad) choices. The theme of the movie – as I’ve hinted at with my review title – is family. Whether blood relations (Gamora and Nebula), adopted de facto family (Yondu and Quill), or chosen (the entire group), family defines and shapes these characters and the choices they make, sometimes subconsciously, but often with a high degree of awareness. While the first movie was largely dominated by Chris Pratt’s Starlord and Zoe Saldana’s Gamora, the sequel focuses much more on the secondary characters that make up the rest of the team. 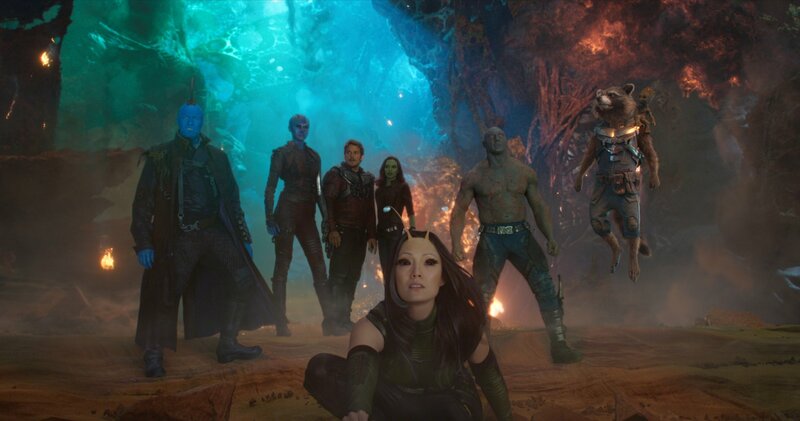 Drax and Rocket get special treatment, and both Yondu and newcomer Mantis get a fair bit of screen time. 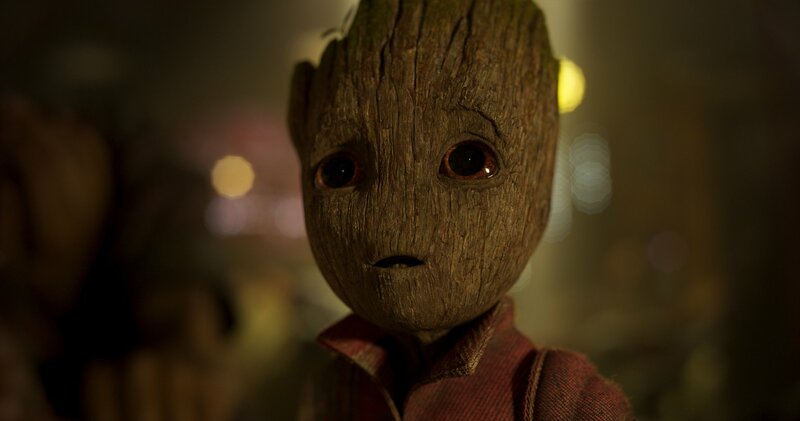 Baby Groot is used extensively as the main comic relief, and while some of the jokes get carried a little far, it is clearly Gunn’s intent to give the fans more of what they want – and nearly everyone loves baby Groot. Being that two of the main characters (Rocket and Groot) who get so much screentime are CGI rendered, one might expect that the effects would wear a little thin; but to be fair, the character models work very well in the movie. Where the effects get a little bit too much is on some of the fight sequences, where there is so much going on that it can lead to a bit of sensory overload. The soundtrack is, for my money, not quite as good as the first movie’s, with songs like “Spirit in the Sky” and “Cherry Bomb” not being easily replaced. The inclusion of George Harrison’s “My Sweet Lord” and Fleetwood Mac’s “The Chain” do add some excellent new tracks, but there are several weaker selections as well (not the least of which is the song one character calls “the best song ever written”). There are plenty of cameos in the film, but I won’t go beyond mentioning the ubiquitous Stan Lee cameo – if you want to be spoiled on the rest, feel free to check out the IMDB credits list. And the end of the movie sets us up for the inevitable (but welcome) sequel, with the credits containing no fewer than five end credit scenes, so you’ll want to stick around right to the bitter end. That’s not to mention that there are some cool little Easter eggs in the credits themselves, so watch them closely. An excellent follow-up to a surprise hit, with interesting and sympathetic characters in a gag-rich environment that are (usually) bigger than the special effects that surround them. Runtime: 2 hrs. 16 mins.